Lodgit Desk makes handy evaluation functions available for your lodging turnover and additional services. It provides you with valuable managerial information that you can also use for your income tax return. How much turnover did your guesthouse generate within the last month? 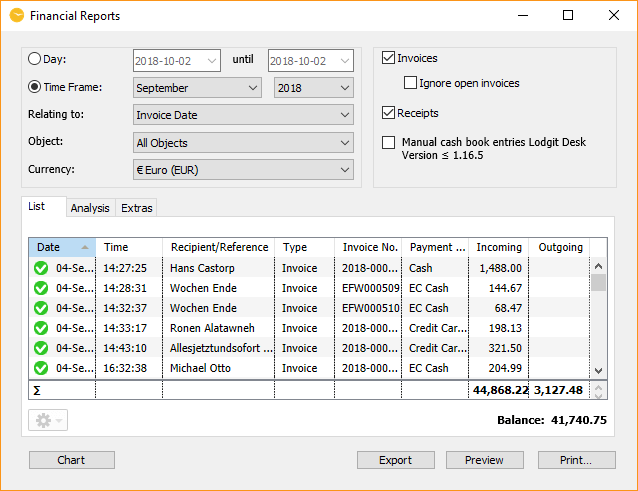 All invoices issued within a specified time frame are displayed in a list, but the cash book entries can of course also be included at will. 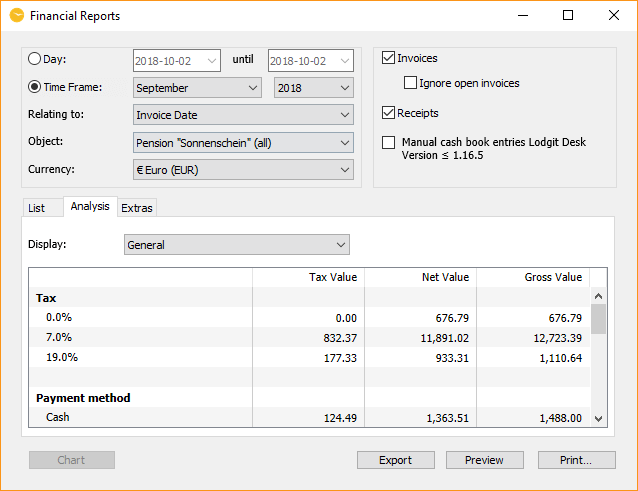 You can determine the accounting periods yourself and also have an individual analysis carried out for each of your units. How much turnover was generated with which VAT rate? Furthermore, you get a flexible evaluation of bookings that have already been billed (invoices and/or cash book entries) according to tax rates, payment methods, revenue type (lodging, extras, cash book) as well as deposits for which a partial invoice has been issued. Depending on how you transfer your input tax, you can also ignore unpaid invoices during the evaluation. Which extras generate the largest turnover? The “extras” view allows you to make a detailed turnover analysis of billed extras. The analysis is in line with the categories that you will have defined within extras management. Can you show the monthly revenues of your hotel? 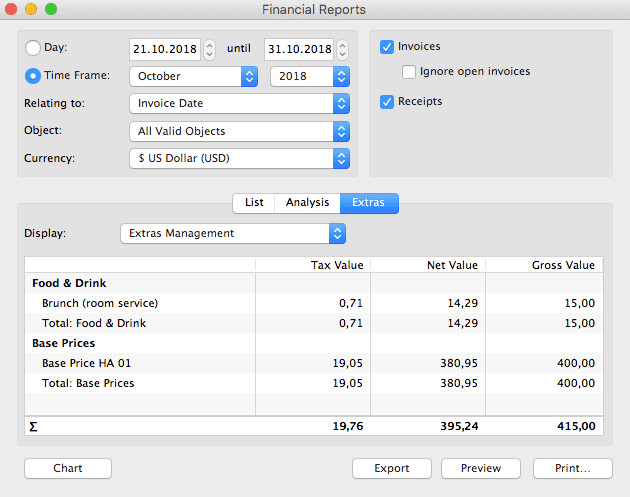 In Lodgit Desk all kind of graphic analysis can be done easily within the Financial Reports area. 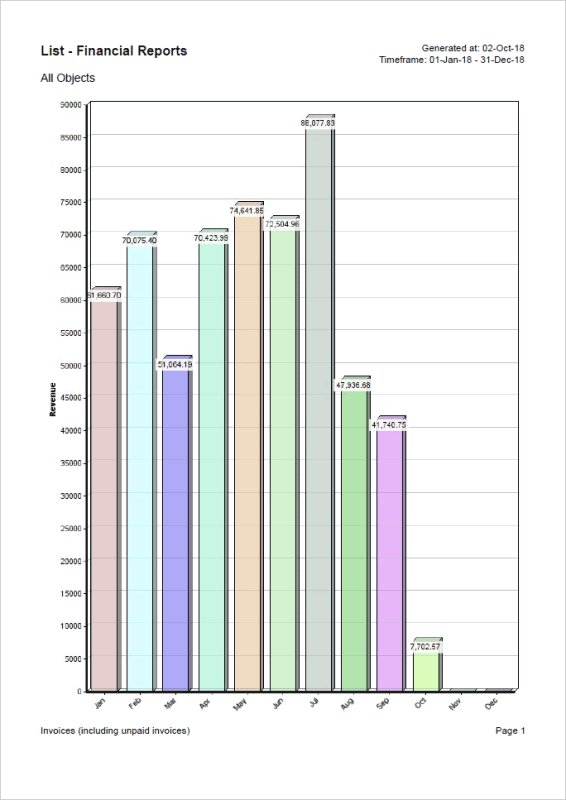 For example the revenue of your hotel can be calculated for any time frame and be shown in a 3D bar diagram.